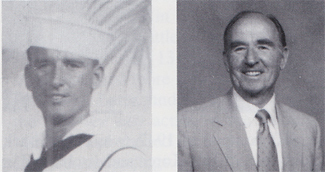 John A. Thomas, Radarman 3/c, born Jan. 20, 1924, Heidelberg, PA, graduated high school and entered the USNR March 11, 1943. He was stationed at Sampson, NY; Norfolk, VA; Whidbey Island; and aboard the USS West Virginia, Bremerton, WA. Memorable experiences were of Leyte Gulf sea battle on April 1, 1945; being hit by a suicide plane; Iwo Jima; and the flag raising at war's end. Discharged Feb. 14, 1946, with the rank of radarman 3/c. Received the Asiatic-Pacific, American Campaign, and Iwo Jima, Okinawa and Philippine Campaign Ribbons. Married and has two children and six grandchildren. He works for Columbia Gas of Pennsylvania in customer service. He enjoys marquetry wood carving, golf and tennis.